Be sure to see The Honeymooners every weekday night at 12:30 am on TV Land! The Honeymooners, revered as one of the most uproarious sitcoms of all time, revolves around the desperate schemes of lovable New York City bus driver, Ralph Kramden (played by "the Great One," Jackie Gleason). Kramden lives in a rundown Brooklyn apartment with his sharp-tongued wife Alice (Audrey Meadows). Inspired by the almighty dollar, Ralph mires himself in get-rich-quick schemes (like investing in no-cal pizza or marketing plastic shoehorns), often coercing his pal and neighbor, Ed Norton, into going down with him. In direct contrast to Ralph's hotheaded, explosive temperament, however, Ed maintains an unflappable, positive attitude through it all. Created by Jackie Gleason in 1951 as a segment for the Dumont Network's Cavalcade of Stars, The Honeymooners originally aired as a series of short sketches within the one-hour variety show. 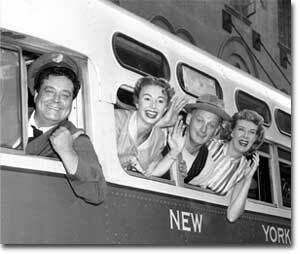 In 1952, after a substantial cash offer, Gleason moved The Honeymooners to CBS as The Jackie Gleason Show starring Art Carney as Norton, Audrey Meadows as Alice and Joyce Randolph as Trixie. In 1955, breaking from the weekly variety format, Gleason let the show's most popular segment stand on its own. The Honeymooners made its debut as a half-hour series, replacing its parent show for a full season of 39 episodes. Now referred to as "the classic 39," these episodes were filmed in front of a live audience and pioneered the standard single-set sitcom style. Surprisingly, The Honeymooners was not the hit it was expected to be, and Gleason returned to the variety show format after one year. Nine years later, when Art Carney returned, additional episodes aired through the end of The Jackie Gleason Show in 1971, featuring Sheila MacRae as Alice and Jane Kean as Trixie. The "classic 39" became a cornerstone of vintage television reruns soon after their original run. And in 1984, fans of the series were treated to "the lost episodes," a series of Honeymooners sketches culled from original kinescopes from the early days. As part of his contract, Gleason had received a copy of each episode and saved them for posterity. A get-rich-quick scheme worthy of old Ralphy-boy himself, Gleason sold them 30 years later to a Kramden-hungry nation.